We heard about Mario + Rabbids Kingdom Battle earlier in the year, and is with many leaks it’s impossible to really know how a game is shaping up until it’s officially revealed. That’s the danger with information coming from non-official sources, we often fill in the missing pieces with our own narrative and that can either give us false hope or a negative connotation before we’ve even seen the game for the first time. Luckily for this game the game looks far and away better than we anticipated. The trailer that Ubisoft showed off at its E3 conference was genuinely funny and the graphics looked absolutely fantastic. Of special note are all of the characters’ animations, which look smooth as silk on the Switch hardware. It’s also refreshing to see Mario and friends in a completely new genre: a strategy game. It appears to ape some tactical games like X-Com, but of course with unique elements that set it apart, not to mention the fact that it’s super colorful and cartoony and set in the Mushroom Kingdom. The addition of Rabbids had us worried, but after seeing them in action we think this unlikely combination could really work. Mario + Rabbids Kingdom Battle is coming exclusively to the Nintendo Switch on August 29, 2017. So not only do we get a brand new Mario game set in a new genre, but we don’t even have to wait that long to play it. Talk about a win-win-win situation. When the Mushroom Kingdom is thrown into chaos by a mysterious vortex, it’s only natural that Mario, Peach, Luigi, and Yoshi come to the rescue. 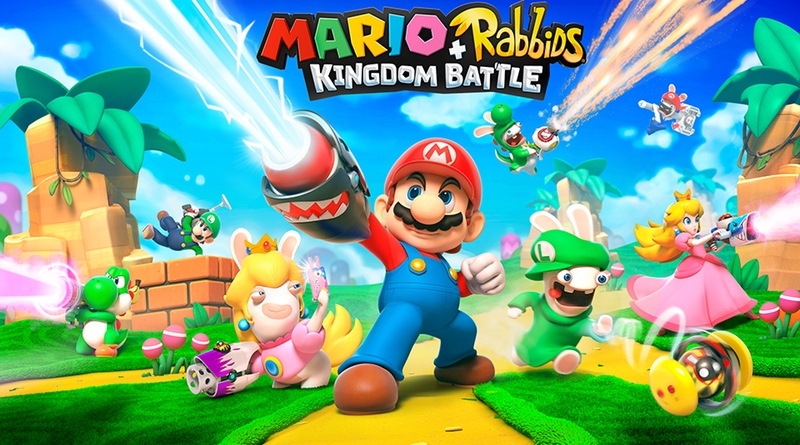 But nobody knows chaos like the Rabbids, and in Mario + Rabbids Kingdom Battle, those long-eared rapscallions will be teaming up with the Mushroom Kingdom crew to try and set things right. Four Rabbids heroes—Rabbid Mario, Rabbid Peach, Rabbid Luigi, and Rabbid Yoshi—will embark on a brand new adventure with Mario, Peach, Luigi, and Yoshi on the Nintendo Switch on August 29. In Mario + Rabbids Kingdom Battle, you’ll explore a Mushroom Kingdom that has been turned upside-down. Those iconic green pipes have sprouted Rabbid ears and turned white, and many other sights familiar to Nintendo fans have been caught up in the craziness. As you explore this colorful, vibrant world, you’ll collect coins, solve puzzles, and find hidden chests containing items and gear to help your team grow stronger against the challenging enemies that stand between you and your goal. Your team of heroes will have to defeat enemies in turn-based battles, wielding unique ranged and melee weapons and using the environment to take cover from enemy fire. You choose three of the eight total heroes to make up your team during the single-player campaign, and you can swap them out to experiment with different combinations. Each hero has their own weapons and abilities, many of which can be cleverly combined to deal extra damage and affect your enemies adversely (e.g. set their butts on fire). The turn-based combat gives you time to consider each move, plan how you’ll use team jumps and pipes to reach optimal positions, and make the best use of each hero’s skills. The destructible cover means you can’t get too comfortable, and your enemies have some tricks of their own to keep you on your toes. In addition to a single-player adventure that spans four worlds, Mario + Rabbids Kingdom Battle also includes co-op challenges (each player controls two heroes each) with multiple difficulty levels for you to take on with a friend and test your skills. You can also use your amiibos to unlock new in-game features. Mario + Rabbids Kingdom Battle will be available in a Standard Edition, as well as a Collector’s Edition that includes a six-inch figurine of Rabbid Mario, a set of physical collector’s cards, and the original soundtrack. If you pre-order, you’ll also get a set of eight unique in-game weapons. Mario + Rabbids Kingdom Battle will be released for the Nintendo Switch on August 29.